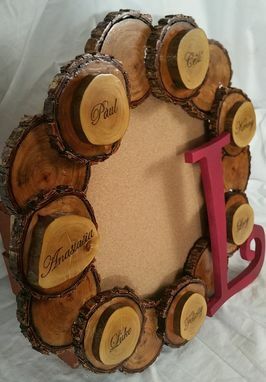 I created this wreath as a Mother's Day gift for my wife. 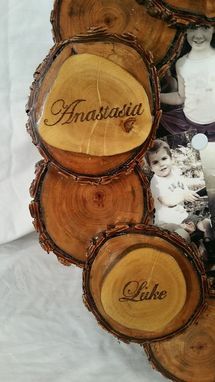 All seven of our children's names are on the smaller discs, and each child has a memorable picture on the cork board backer. The "L" is for our surname, and can also stand for "Love". This wreath was, indeed, a labor of love. These wreaths can be used for birthdays, anniversaries, graduations, pet memorials, retirements—the list is pretty much endless, right? 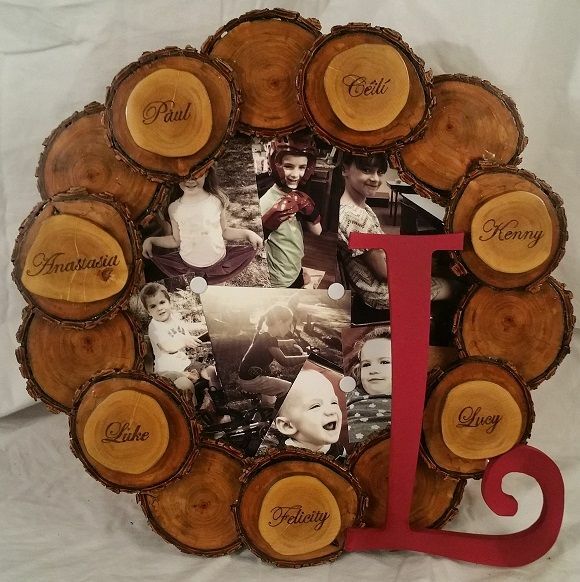 They're made of a variety of air-dried hardwoods such as Chinaberry, Catalpa, Oak or Maple and are adorned with small discs of Crepe Myrtle which contain the names of friends, family, pets or co-workers, etc. 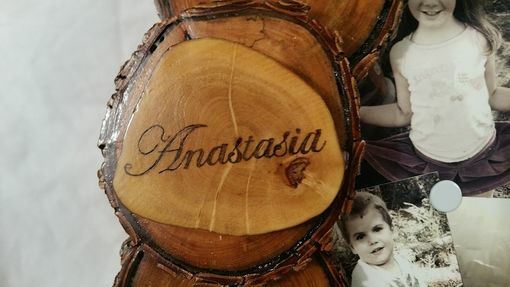 burned into the wood with the technique known as pyrography. These are handwritten, not machined. Very important to note: the wood is taken from timber that has been either storm-felled, standing dead timber, from pruned limbs and is otherwise a naturally sourced raw material. I don't harvest live trees or branches for the purpose of making these items. The discs are then cut to size, sanded multiple times and then given three coats of varnish, with light sanding between the coats. If you wish for the wreath to be outdoors, then a spar urethane will be used for better UV protection. The large letter affixed to the wreath can be for a surname, given name, company name, political party, university, etc. Again, you're only limited by the imagination! The backing is cork board which allows for the changing out of photos, ribbons, pins, dried flowers, keepsakes--anything you want to memorialize. Finally, the wreath is hung using wire to help evenly support the weight. Depending on the size, these can be heavy, but the proper hanger and anchor for your wall will let you enjoy it for a long time. Pricing depends on the number of names and overall size of the wreath. The minimum size is 12" and prices at $100. 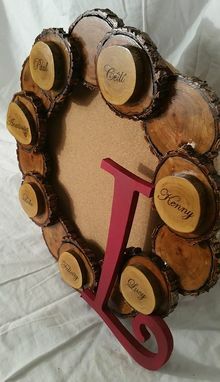 This size wreath can hold up to seven names with one name per disc, as the wreath in the photo shows. 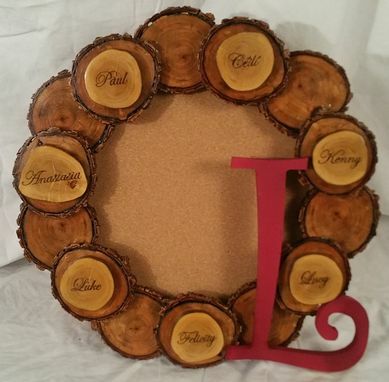 These can be customized to allow 14 names on a 12" wreath. The price for this wreath is $150. If you'd like a larger wreath, up to 18", please contact me for details. Due to the amount of customization that can be put into these projects, pricing is hard to give until the specifics are known. Generally, an 18" wreath will start at $200. Thanks for looking, and I look forward to working on your memorial wreath!